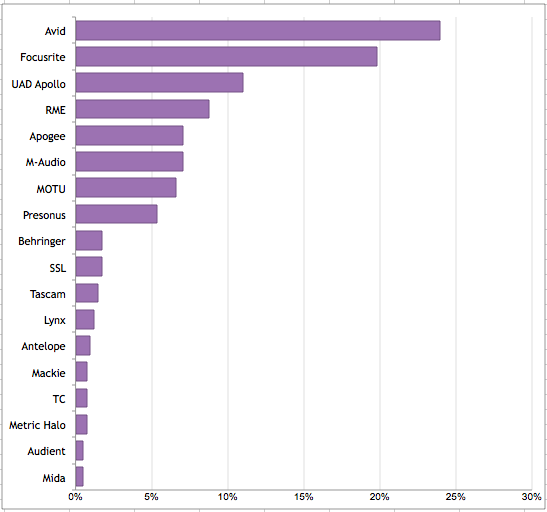 We held a non scientific straw poll on Facebook of what audio interface brand Pro Tools Expert community members use. After 355 responses this is what you have told us. Avid is at the top with 98 but what was surprising is that it isn’t by much. Focusrite come a very strong second with 81. Then we drop a long way to Universal Audio with their Apollo interfaces taking 3rd place. What perhaps affects the results is that many people may own Avid interfaces as part of bundles or because they use HD/HDX systems. Focusrite have been aggressive with their pricing to features offering and this seems to have paid off for them.